Introducing the Alumni and Student Spotlight feature! We are very proud of our Alumni and Students at UT Health San Antonio – you are making lives better in our communities every day. We want to tell your stories and celebrate your successes while also introducing you to some of the next generation of health care leaders. We hope you enjoy reading about Alumni and Students who are making a difference for UT Health San Antonio on campus and in their communities. What was the most valuable lesson – inside or outside the classroom – you have learned at UT Health San Antonio? This is a difficult question because I truly learned so much during my time at UT Health. I guess I would say it was through listening to the experiences of my professors and during my clinical rotations where I watched and learned from physical therapists and other professionals in the community that I learned that forming meaningful personal and professional relationships are keys to success! In both the field of physical therapy as well as in gaining meaningful experiences in both professional and personal life, relationships are the foundation of that. I feel fortunate to have learned and observed this early in my professional life, and it has had a positive impact on both my personal and professional life leading me to feel a high level of happiness in both at this stage in my life. What inspired you to want to become a physical therapist? I have always been active in sports and interested in the amazing intricacies of the human body, in particular the muscular-skeletal system. I grew up thinking I wanted to become a physician, but after working in a hospital one summer after my freshman year in college, I was exposed to the field of physical therapy and immediately became completely hooked. I also was attracted to being able to form relationships with patients, learn what motivates them, and use that information to help them achieve their goals. What do you remember most vividly about your time at UT Health? Those were wonderful years! I have so many fond memories of my time at UT Health! The friendships and the faculty stand out the most to me. Coming from a large university, I had grown accustomed to large classroom learning environments and less personal interaction time with professors and teachers. When I started the physical therapy program, I immediately was impressed with the personal relationships and the faculty-student relationships. The faculty were not only there to teach, they were there to help mold and shape students to reach their own potential. They were helpful in and out of the classroom and really took the time to get to know students’ motivations and backgrounds and then created a very successful classroom and lab learning environment. The class size was perfectly conducive to allowing students to form wonderful friendships and create a tight-knit community. Being in a setting where everyone was working toward a very common goal – to be a great PT – made those bonds even stronger. 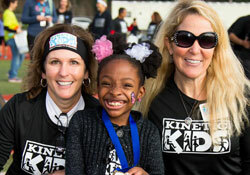 My greatest professional achievement is co-founding a non-profit organization called Kinetic Kids. In 2001, after realizing the scarcity of sports programs for children with special needs in this community, Kacey Wernli, PT (Class of ’94), and I started a baseball team of 12 kids with special needs from our physical therapy practice. These kids yearned for and dreamed of participating in sports like their siblings and peers. Today we serve more than 2,300 children a year in 17 different sports. We have removed the stigma that kids with special needs cannot be athletes, and we are proud to be the only therapist-run sports-directed program for children with special needs in this state! We currently serve children 18 months to 21 years in a variety of team sports, allowing ALL kids to get off the sidelines and onto the playing field! Think outside the box for your clients and patients. Whether it’s a certain exercise they might need, a varied use of a modality, or a new program or organization that might benefit your patients, think outside the box for what is best for them!It keeps you dialed in as a therapist and always thinking and that makes being a physical therapist even more fun and rewarding! Do your homework, research, reach out to others, and go for it! 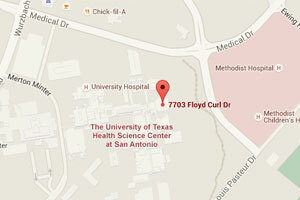 What is your anticipated graduation date from UT Health San Antonio? As a student, which specialty(ies) interest you most? I am primarily interested in orthopedic rehab, especially involving manual therapy. What has been the most valuable lesson – inside or outside the classroom – you have learned at UT Health? Growing up I was always very hesitant to give 100 percent to anything, scared of failing and comforted by the notion of, “Well, maybe if I had really tried.” Even with successes, I was haunted by the thought of what I could have done if I had indeed given my all. Here at UT Health, I’ve pushed myself in every facet I could, and I have been amazed to find that most stumbles are recoverable and that my 100 percent ceiling is somewhat elusive. My potential is greater than I thought. What inspired you to want to become a health care professional? When I was 14 years old, my youngest brother, age 4 at the time, broke his femur. After the full lower-body cast came off, he was unable to walk with any degree of stability, and he was unable to keep up with the rest of us. His spark was gone. An older brother and I helped reteach him to walk and then run—thinking that if he was walking and running like us then he was doing it right. I can still remember how good it felt seeing my little brother return to the cheerful, goofy kid he was when he was finally able to run and play with us. Several years later, I learned about physical therapy, and I knew exactly what I wanted to do with my life. What has been your most rewarding experience at the university thus far? I’ve been blessed to be a part of an incredibly cohesive cohort. Learning beside and from them has been my most rewarding experience here by far. This journey would be very different if I weren’t a part of the DPT class of 2019. Balance your life. This can’t be stated enough. Prioritize and schedule your time so you optimize your studying but don’t neglect family, faith, or self. Be ready to adapt. If your old tried-and-tested study methods aren’t yielding the results you want, then always be ready to try something different. Push yourself. If you’ve always wanted to give leadership or some other skill a try, then go for it. Find an opportunity, toss your hat in the ring, and then accept every lesson as it comes. How do you intend to give back and pay it forward for future students? Once I graduate and am working in the field, I plan to give what I can financially so that deserving future students can spend a little more time studying and a little less time stressing about their budget. I also hope to be involved in the clinical education of future graduates in my field. The gifts of knowledge and guidance that I’ve received from my mentors thus far have been priceless, and I can’t wait to pay it forward. Neil McDonald. He inspired me to change my major from business to physical therapy. Neil suffered a near-drowning accident at 4 years old and lived close to my house, and I met his physical therapist while reading to him one day. It was then that I knew I was meant to be a physical therapist. My greatest professional achievement is Kinetic Kids. After working for several years without being able to refer children with special needs to any sports organizations, it gives me joy to know we are giving ALL kids the chance to play sports and be part of a team. To see children come alive while dancing, sliding to home base, and walking across a balance beam gives me the confidence knowing we are changing lives in these kids by building confidence and self-esteem. The families who have been told their children will never walk or run see a different picture when their child is swimming across a pool or competing in wheelchair basketball. What is your current occupation and where? What’s a day on the job like for you? 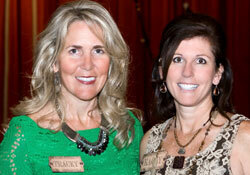 I am the co-executive director and co-founder of Kinetic Kids. One day a week I continue to work as a pediatric outpatient physical therapist at Therapy Links. A day on the job for Kinetic Kids starts with the business side of running a nonprofit, checking on grants, checking in with employees, planning programs, and planning events, and it ends with going to a program where it all comes together and I see why our job is so important! The kids, volunteers, our dedicated program directors and coaches put all the pieces together to provide sports where all children are safe and successful. That is the best way to end my day! Why do you give back to the university (time and/or donation)? I give back to UT Health with my time and knowledge so that I can share my experiences with students in hopes that some may want to invest more of their time and education working with pediatrics or starting their own Kinetic Kids one day! If you would like to nominate yourself or a fellow alumni or student to be featured in our next Spotlight, please email alumni@uthscsa.edu. Nominations should include: name, graduation year and degree, notable career achievements, current occupation.